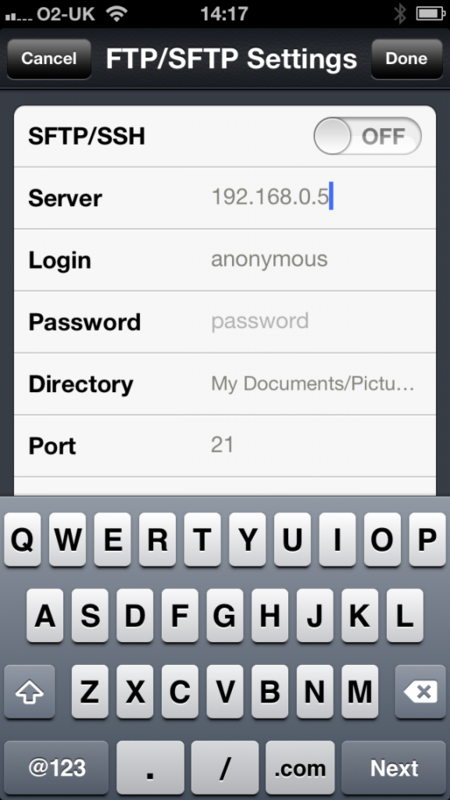 …and syncing photos with PhotoSync. I’ve used the excellent PhotoSync app on my iPhone and iPad to backup photos to my iMac. This works well, but requires me powering the iMac on to run the sync. As my Pogoplug is always on, and has a bunch of storage connected to it, I thought it would be great to be able to sync from my iDevices to the Pogoplug whenever I’m in range of my wireless network. PhotoSync supports syncing to FTP servers, so I decided to experiment with installing and setting up an FTP server on the Pogoplug. and replace the value in quotes with the /tmp/ path for your hard drive, save and close the file. Note: My setup allows for anonymous access to the FTP server, this is not secure. I’ve completed the minimum amount of configuration to get the FTP server up-and-running in order to experiment with how well it performs with PhotoSync. If you intend to use this setup long-term, I would highly recommend checking out and updating the security settings in the bftpd config file. Package zlib (1.2.5-1) installed in root is up to date. I found that you have to copy libz.so.1.2.5 then rename it to libz.so.1. It’s looking for that specific file name in order to start the ftp server. My problem now is that I can’t logged on using anonymous. I’ll try to enable security and see if that helps. If anyone has suggestions let me know. Great guide! Do you know which part of the config file has to be updated for a password? 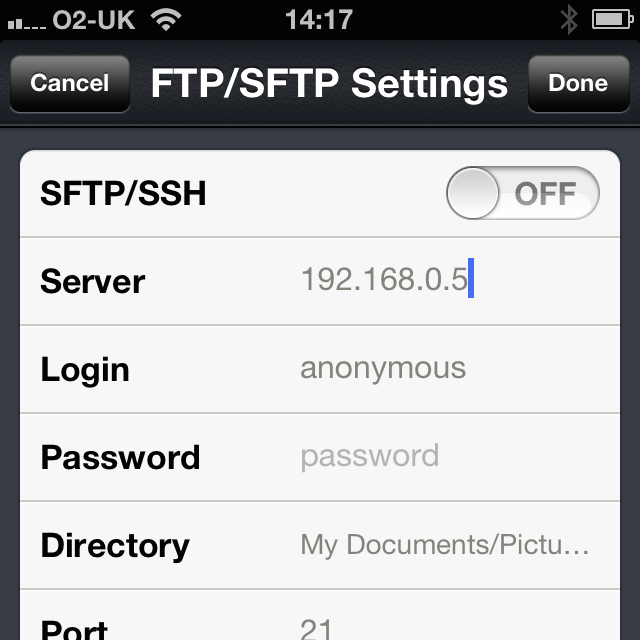 Also, can I turn on SFTP or will this program support normal FTP? Once again, awesome guide. How do I add users? Been looking for and used the file one and no go, I am doing this on the pogoplug, thanks. Ok now it worked the add users. I have it runing and I can log in within the lan but when I do a porf forwarding on my router it just kicks me out, any idea where to look for this? Thanks. How can I access my FTP server over the internet, so I can use it akin to the pogoplug file sharing service but openly for my work. I would like to keep most of the hard drives private except the one I decide to share via ftp and allow that to be accessed freely and anonymously. We have a combination of Mac’s and Windows PC’s. Will appreciate any help, Thanks. I worked through the steps and tried connecting with Cyberduck (mac ftp client) and it doesn’t connect but it also doesn’t give me any error. I haven’t seen that behavior from Cyberduck before. When I check the FTP log file I see the following. Mon Apr 7 00:42:14 2014 /opt/sbin/bftpd: Quitting. 2 things that seem relevant to me are obviously “unable to open /var/log” and “Incoming connection from 192.168” since it doesn’t show my computers full local IP address. Any ideas what needs to change here? Just an update, I found my log for Cyberduck. Pasted below. 220 bftpd 3.7 at 192.168.0.8 ready. 421 Unable to change root directory. No matter what I do I can’t get past this error if anyone has suggestions I’d appreciate it. Both errors below are very generic. I’ve been searching all night for a solution and found several hits but nothing seems to work as most hits are from users running bftpd on Linux distros and not on a Pogoplug so their solutions point to directories or files that don’t exist on a PP. 421-Could not open log file. 421 Server disabled for security reasons. could you publish the whole process of installation and starting of SFTP server on pogoplug (could be on Pogoplug Series 4)? @Aaron – Thank you very much for these instructions! Clear and concise, much appreciated. @Chris – Not sure if you found a solution or not. I did have the same problem but was able to connect once I changed the ROOTDIR value located at the very bottom of Aaron’s config file in the ftp user settings. Also add your mounted disk path here. Your articles are great help and I was easily able to install both FTP and Samba on my Pogoplug without any problems. Credit goes to your step by step guide. Well, Soon after after setting up Photosync on my mobile, I started facing a strange issue. Photosync is able to copy only few images before it fails (without any error). When I tried the same process from other mobile it was successful. Any idea what could be the problem?